This project seeks to increase resilience to wildfire hazards by modeling and mapping community and ecosystem service vulnerability to wildfire. 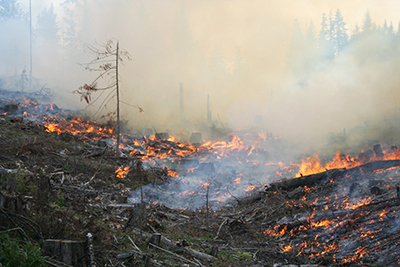 The project will focus on the Pacific Northwest region to develop a model that will improve our understanding of factors that contribute to wildfires becoming disasters, and prioritizes stakeholder and involvement and public engagement to identify management actions that will increase adaptive capacity and overcome social and political barriers. The overarching goal of this project is to support policy and other decision-making processes at local, regional, and national scales to reduce the risk of wildfire becoming a disaster and increase community and ecological adaptive capacities. Below is a select list of funded proposals, demonstrating how MILES research is building capacity to study complex social-ecological processes. Reverberating Responses to Trophic Cascades across Ecosystems: from Land to Streams and Back Again (Collaborative Research). NSF-DEB Population and Community Ecology program. PI: D. Warren (OSU), Co-PIs: Colden Baxter (ISU), Ripple (OSU) $1,000,000. Gateway Scholarships for Biological Sciences. National Science Foundation. Establish and manage a faculty-mentored cohort program that provides scholarships and a coherent ecosystem of support for low-income, academically talented DBS students. Implement an enhanced risk-based advising system to enable academic advising staff and faculty mentors to proactively advise scholarship recipients and keep them on a successful track to graduation. Co-PI: Jennifer Forbey. $1,000,000. Center for Advanced Bioenergy and Bioproducts Innovation. DOE Bioenergy Research Center. Tara Hudiburg. $760,000. Scaling Up Local Fruit and Vegetable Production in the Inland Northwest: Identifying and Overcoming Constraints for Sustainable Agricultural Development. USDA-AFRI. PI: Felix Liao; Co-PIs: Darin Saul, Colette DePhelps, et al. $490,000. Statewide Risk Assessment and Adaptive Management of European Frogbit. 2017 Michigan Invasive Species Grant Program (MISGP). Jodi Brandt. $350,000. Forest mapping using RapidEye imagery in the Eastern Upper Peninsula, Michigan. 2017 Sault Tribe of Chippewa Indians. Jodi Brandt. $280,000. Collaborative Research: Causes and consequences of fire-regime variability in Rocky Mountain forests. NSF. Tara Hudiburg. $241,818. Measuring Feedbacks Between Farmer Adaptation to Irrigation Water Restrictions, Land Use Change, and Water Availability in Southeast Idaho. United States Department of Agriculture, Agriculture and Food Research Initiative, Resilient Agroecosystems in a Changing Climate Challenge Area Strengthening Seed grant. Morey Burnham (PI), Katrina Running, Jodi Brandt, Margaret V. du Bray, Alejandro Flores, Vicken Hillis, Zhao Ma, and David Yu. $149,993. Overcoming perceptual barriers to climate change adaptation among ranchers in the western US. USDA. Morey Burnham (co-pi). $149,631. Effects of long-term alternative cropping systems on soil health and nutrient transport. USDA-ARS. Erin Brooks. $90,000. Conservation strategies for golden eagles in western North America. Department of the Interior U.S. Fish and Wildlife Service. Julie Heath. $51,000. Investigating relationships between animal diversity and river-riparian habitat heterogeneity in a wilderness watershed. DeVlieg Foundation. PI: Colden Baxter. $50,000. Prototyping a methodology to develop regional-scale forest aboveground biomass carbon maps predicted from Landsat time series, trained from field and lidar data collections, and independently validated with FIA data. NASA – carbon monitoring systems. Alistair Smith. $678,984. Community-based Hazards’ Planning and Mitigation: Planning, Legal, and Policy Implications in the WUI, Primary Sponsor: Idaho Department of Lands. Originating sponsor: Forest Service/USDA. Funding Source: Federal Flow-Through. Department: Community and Regional Planning. OSP number: 6239. Wuerzer, T. (PI), Lindquist, E. (Co-I), Vos, J. (Co-I). $239,263. The MOSS Climate Fellowship Program: A collaborative partnership between the NWCSC and MOSS to advance climate science, education, and communication, USGS Northwest Climate Center. PI L. Vierling with Co-PI K. Eitel. $50,000.